ICTA, since its inception, has played a key role on the development of ICT in the country. Digital literacy has reached 39%, and ICT exports have surpassed $1 billion, making ICT the 5th largest foreign exchange revenue earner. In line with the national development priorities and digitisation agenda of the Government, under the guidance of Telecommunication Digital Infrastructure and Foreign Employment Minister Harin Fernando, and the supervision of the Secretary and Officials of the Ministry, the newly appointed leadership and management of ICTA is geared to provide the benefits of ICT to every citizen in the country. From the inception, ICTA has taken the lead in creating a pro-active policy and a regulatory environment that is supportive of the ICT transformation and ICT-based development. Key initiatives include drafting digital legal enablers (namely, the Electronic Transactions Act, the Computer Crimes Act, the Payment Devices Frauds Act) and setting up the digital certificate framework for Payment & Settlement Systems Act for the Central Bank of Sri Lanka. Presently, ICTA formulates regulations for implementing of cross-government digital solutions, and took part in the formulation of the Right to Information Act (2016) and Amendments to the Mutual Assistance in Criminal Matters Act (2018), to facilitate cross-border access to electronic evidence. In partnership with The Finance Ministry and the Central Bank, ICTA played the lead role in formulating the Financial Regulation (FR) Circular No. 447/2010 and the Lanka Government Payment System (LGPS), which has enabled the use of credit cards and electronic payment methods to pay for Government services for the first time. ICTA also gave leadership for Sri Lanka’s entry into both the digital law treaties, which were firsts for South Asia and facilitated the Electronic Transactions (Amendment) Act No. 25 of 2017. The ICT Industry is a key development sector in the country, which contributes significantly to GDP and foreign income of the country. The sector also provides a significant number of employment opportunities, especially to the youth. Understanding the importance of the sector as a key driving force, the ICTA initiated the Industry Development program. The program is supporting the sector goal of $5 billion export revenue, especially through entrepreneurship, innovation and digital adoption. E-Local Government (eLG) is a high demanded solution used in local authorities (Pradeshiya Sabhas, Urban Councils and Municipal Councils) to capture regular revenue, non-regular revenue and applications such as construction permits. This year, the ICTA has managed to expand the services of eLG, with new features to another 50 local authorities, to enhance the quality, efficiency and effectives of service delivery to citizens. The Lanka Government Network (LGN), initiated under the e-Sri Lanka Program, is the underlying information infrastructure backbone (dedicated network) that connects all the Government organisations of Sri Lanka in a cost-effective and secure manner. The LGN 2.0, launched in 2017m aims to connect 860 Government organisations in the first phase. At present, 817 Government locations are successfully connected to the LGN, benefiting more than 67,000 Government employees. Integrated with Lanka Government Cloud (LGC 2.0), the LGN facilitates access to many eServices and applications. 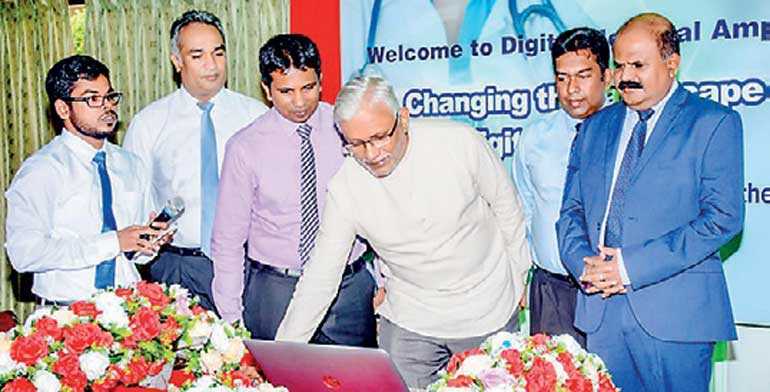 Under the Digital Health initiative, the ICTA has digitised 32 hospitals to date, and has been able to facilitate informed decision making at the Government Hospitals. Also, the systems and processes introduced though the Project have been able to reduce the average patient’s waiting time at Out Patient Departments (OPD) significantly. Providing ‘e-channelling’ services in the Government Hospitals for the first time, on par with any private hospital but without a payment, is the greatest achievement of the Project. The improved work processes such as implementation of PACS are saving millions of rupees monthly for the Government. More than 850 “SMART Social Circles” have been established in 25 districts under ICTA’s Citizen Empowerment initiative. A pool of 8600 knowledge agents were trained and more than 500 women entrepreneurs were supported under the “Suhuruliya” initiative. The eLand Registry (eLR) system facilitates the property registration in the country through the land registries, and is currently being implemented at Colombo and Delkanda Land Registries. E-Revenue License (eRL) is the National-level centralised solution for issuing of Vehicle Revenue License in Sri Lanka. This covers all Divisional Secretariats and the Province Department of Motor Traffic. The system is being used by about 2,500 Divisional Secretarial Staff to issues revenue licenses. The system has also provided facilities to collect revenue licenses online. E-Registrar of Companies (e-ROC) facilitates online Registration of Companies, and has been live since April 2018. With the system, average time to register a company is reduced to 1 day, which is a main indicator of the “Starting Business Index” of Sri Lanka. With the system, approximately, 40+ new companies register online per day. Electronic Document Attestation System (eDAS) is a Cloud-based service platform, which has granted the consular division of the Ministry of Foreign Affairs (MFA) to reduce the document processing time significantly; e.g. down to fifteen minutes from 1-2 days before implementation of the system. The eDAS can be accessed by foreign diplomatic missions and Sri Lankan missions abroad for processing of documents, and currently serves over 12,500 applicants and processes over 30,000 documents monthly. The system facilitates status notifications to customer mobiles via SMS and emails. Based on the successes and lessons learnt from on-going initiatives, ICTA has taken measures to introduce new strategies, and to make the government services effective and efficient with digital innovations.